You can access, upload and maintain your data by connecting to GIS Cloud with Secure File Transfer Protocol clients. Access through SFTP offers you a new way of syncing your data with the GIS Cloud in addition to fast and secure file upload. Download and open your favorite SFTP client. In ‘Port number’ box enter 22. 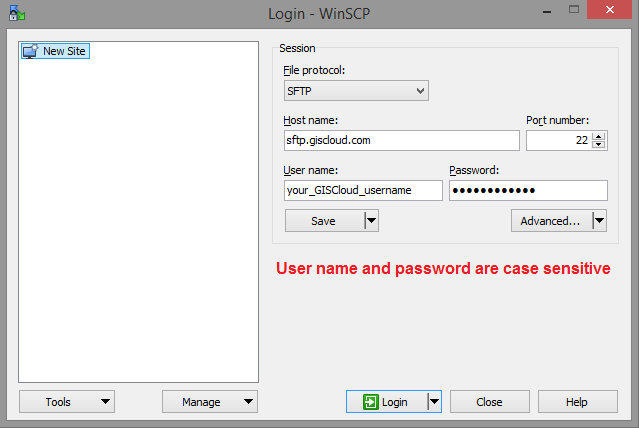 Enter your GIS Cloud username and password and login. Note: Characters are case sensitive so make sure that you type the exact username and password when logging in. You can check your username in GIS Cloud Manager (Users tab – Login information).